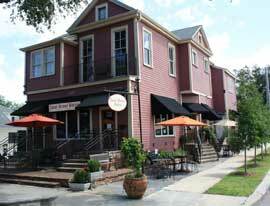 As stated in a previous post, Blue Dot is a new addition to the restaurant row, having been opened only last year. The building it occupies, however, is one typical of the area, dating back to at least 1908, when it first shows up on the Sanborn maps as a storefront. The building has been converted at least twice since then: in 1940 it was divided into a store and two living apartments (a difficult arrangement to imagine if you have seen the size of the building). It now stands proudly radiating blue into the neighborhood, calling people to come and clog their arteries on delicious donuts which are made entirely on site, including any icings. I have been inside twice: one weekend at dawn in March, and yesterday at around 10:30 in the morning, both times accompanied by my roommate, Katie. At dawn, we had the place to ourselves. There were only two teenagers behind the counter and everything was fresh and clean and quiet. Not so at 10:30. When we arrived, there were people sitting at two outdoor tables and two indoor tables and the line went out the door. Two middle-aged men came around the counter to have a chat with a customer while the four teenage workers hustled to get everyone served in a timely fashion. The table at which Katie and I sat was under a window which, in true New Orleans style, had wrought iron decorations doing double duty as a security devise. The shape of the building is long and narrow like a typical New Orleans shotgun house and the outdoor tables are the metal kind you see in front of any of the areas restauraunts, but the decorations are of a style all its own. All of the walls are painted blue, inside and out. A blue light glows in the window at night. There are pictures of donuts on the walls. The curtains are white with a blue spotted pattern. Even the indoor light fixtures are blue and round. This cozy shop is a great addition for those in the neighborhood who need a quick, delicious breakfast on the go. If you’re really in a hurry, though, you may want to get there a bit early: the lines will be shorter and you’ll be more certain to get your hands on a bacon-covered long john! Just three blocks away from the hustle and bustle of the area busy thoroughfare and into the residential side lies a a quietness, a peacefulness that is otherworldly from what lies a stone’s throw away. Birds chirping, and casual footsteps along the sidewalks awaited me as I approached Grace Lutheran and Christian’s successor, Redemption. What I noticed immediately is how they repurposed the info booth outside the church to house the menus, and the restaurant’s mission statement. As I approached the glass enclosed marquee entrance I already felt out of place and under-dressed. I know they say you can come to church as you are, but this ain’t a church no more! As I was in nothing more than the equivalent of gym clothes I almost turned around and left. However when I went in hostess might as well been an usher because she was very welcoming. As I stepped in , it almost felt magical. It felt like somewhere I’ve been before even though I never stepped in here. Despite the high ceilings, the space felt warm and romantic with a rose on every table and a local painting on every wall. Servers, of course were a far cry from those at Juicy Lucy, with their all black ensemble, clean shaven faces and non-visible tattoos. Also to mention there were no cigarette butts lining the sidewalks. As for Juicy Lucy, staff smoke out in front while waiting for customers. I’m sure Redemption has a designated area in the back for that. 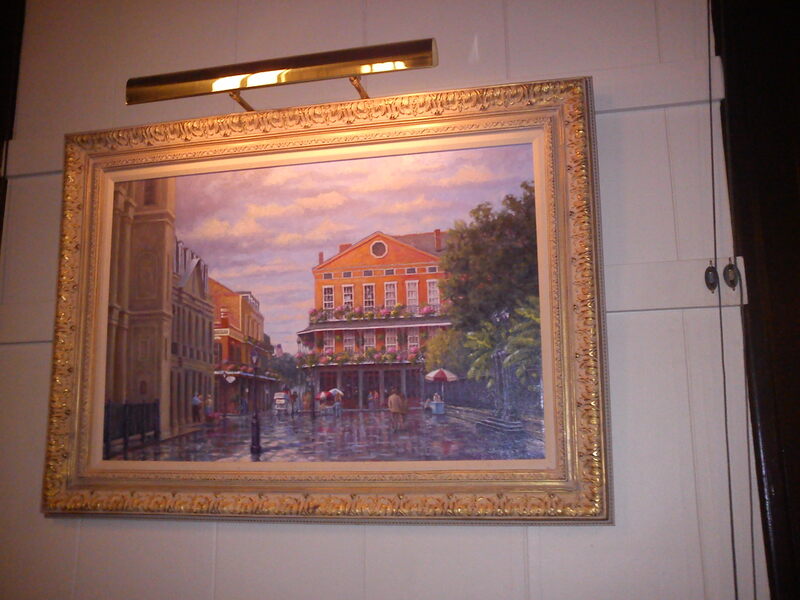 Photos like this are by local artists are hangin on the walls throughout Redemption depicting French Quarter architecture and jazz musicians. After my first visit, I would then later on return ( in my sunday best, no pun intended) to interview Greg Picola, the Executive chef and General Manager of Redemption. For a leading chef in New Orleans that works 85-90 hours a week, and to what many say is the main reason people have been attracted to Redemption, he came off as very modest, warm and familiar to talk to. I felt as though I was talking to longtime friend of my mom’s. He even offered me something to drink, at no charge. He has been working for Redemption for 6 months, before that he was renowned for his culinary expertise at The Bistro at Maison de Ville for over 20 years. Before I interviewed him, both Samantha and I talked to Denise, who is Mike Juan’s “Gateway,” as she puts it; She has been in the restaurant industry for over 20 years also, working at such venues in Fort Walton Beach in Florida, California, and 11 years at Houston’s on St. Charles as a manager. She wrote employee manuals and was lead manager during her career. The interviews had their similarities and stark differences. 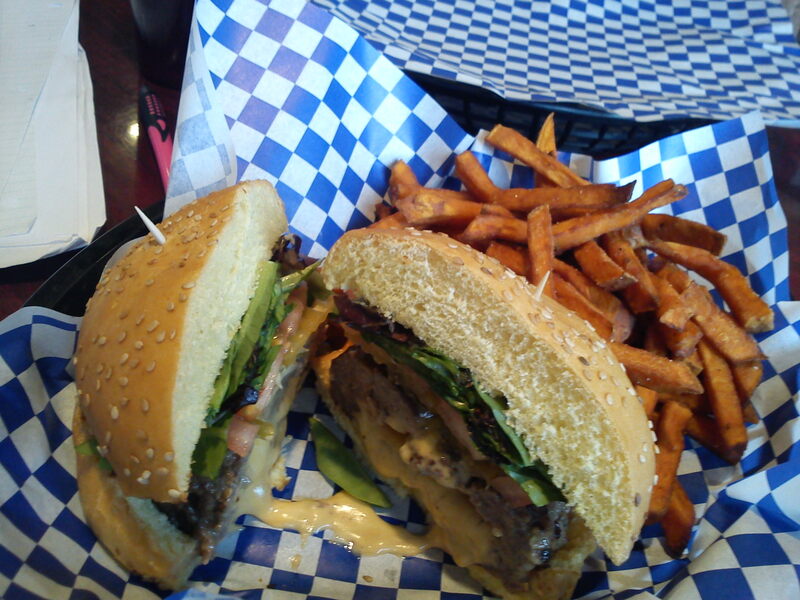 Juicy Lucy currently does not have a website , but you can “fan” them on Facebook, or stop in and tell’em Stephanie sent ya! One Last Note: I hope this project continues and the the next class or group will keep up with this also, at least until the new area developments are up and running. Peace! Me and my partner, Samantha, have chosen quite a pair of restaurants which couldn’t be any more opposite from one another, yet I think both represent New Orleans in a fair light. Redemption and Juicy Lucy are two of the newer additions to the Restaurant Row in which there has been no previous research by the Restaurant Recovery Row Project (RRRP). So it is quite refreshing to take on two totally new places. Historically speaking, the current building of Juicy Lucy has switched hands multiple times going back to the mid 1930’s, while Redemptions has only had two main previous entities-Christian and Grace Lutheran Church. Also historically, in the context of the city’s restaurant and food culture, there has been a dichotomy in the popular imagination: one being that New Orleans has beautiful long standing classic family owned restaurants and on the other hand known for having a “funky” atmosphere where “true” locals go to get great food before heading out to bars (most cases they are the same place)—usually these notions lean toward the latter. Areas like Mid City disband both schools of thought by actually infusing them together. Before I even stepped into Juicy Lucy, the first thing I noticed was the noise; traffic passing right behind me, people passing right by me going to various places and in front of me were two tables, one of them occupied by a groups of ladies who were being blatantly being “hollered at” by the cooks from the Italian Pie next door. It was a relatively slow time that Monday afternoon, so servers were chilling outside the store front smoking cigarettes until a customer came. Their uniforms were very laxed, going beyond just jeans and a t-shirt. One server had multiple face piercings and full neck tattoos. He was the one that actually approached me for service. Despite the uber informalities, he was very nice; “ Hi how ya doing? Need a table for two?” to an unsuspecting tourist, they might think he was going to assault them. I informed him that I was an anthropology student from UNO continuing a two year project and that there are other students involved reviewing restaurants in the area. He said the owner was not available that day, I hope to interview him soon. In the meantime, it was lunchtime. When I was seated, I was facing a large wall sized mirror that gave the illusion of the space being bigger than what it was. Music from the local radio station was blaring and there were flat screen tvs by the bar. 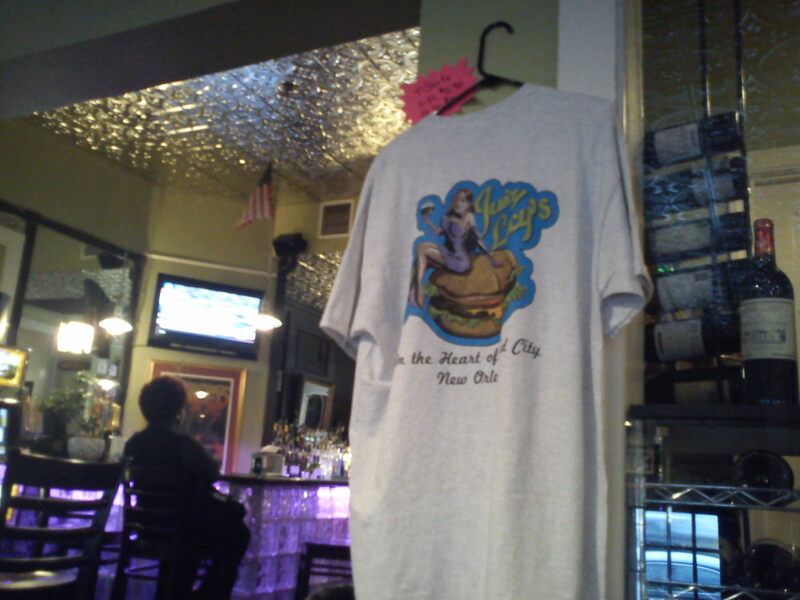 The wals are dawned in New Orleans/Mardi Gras décor and Juicy Lucy merchandise. When the food comes out, no plates; it’s just a basket lined with blue and white checkered paper. If you’d like, you can have a glass of red wine with your meal, for the wine case is see through and visible from the dining area. Overall Juicy Lucy offers a very no frills space to enjoy a bite to eat, hang out with friends, coworkers, etc and hang out at the bar, or catch a game on tv as with most places in this area. 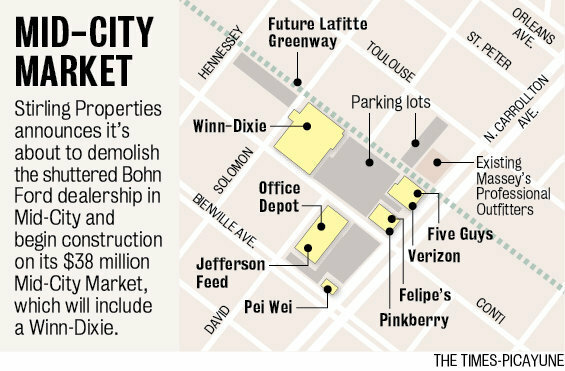 However, one would not know that what lies three blocks down Iberville is a whole other deal. 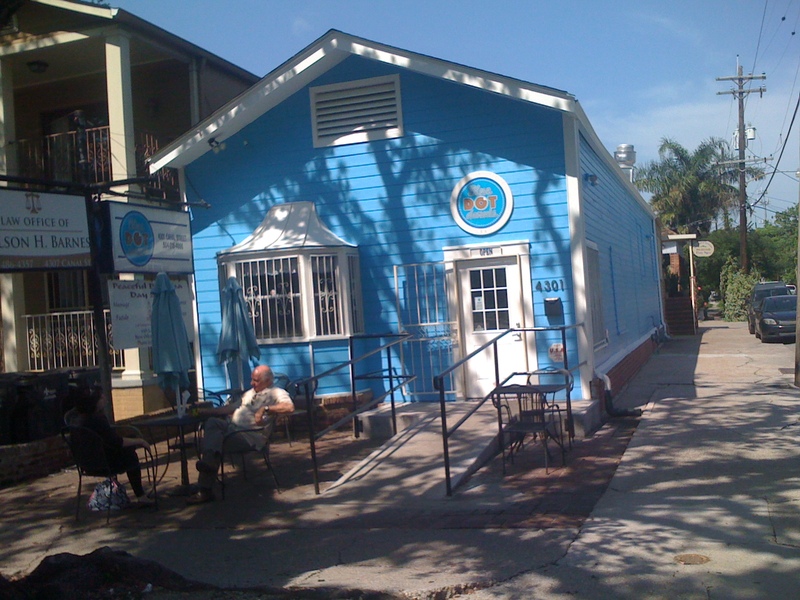 Blue Dot Donuts, at 4301 Canal Street, marks the lake side boundary of our restaurant row on Canal Street. It hasn’t been looked at in this blog, so I think that I will introduce it now. I will also use their spelling of donut for the rest of this entry. It is very blue. At night, the window are illuminated by a blue light, making the little donut shop look otherworldly. Opened by three cops (I will leave you to make your own joke . . . ) in 2011, the shop is home to more than just the traditional glazed donut. There are specialty cake donuts, donuts named after super heroes,and donuts topped with bacon. On the authority of the counter staff, it is best to call ahead if you are interested in sampling the bacon donuts. I watched them sell out for the day, leaving a few late comers without their salty-sweet fix. 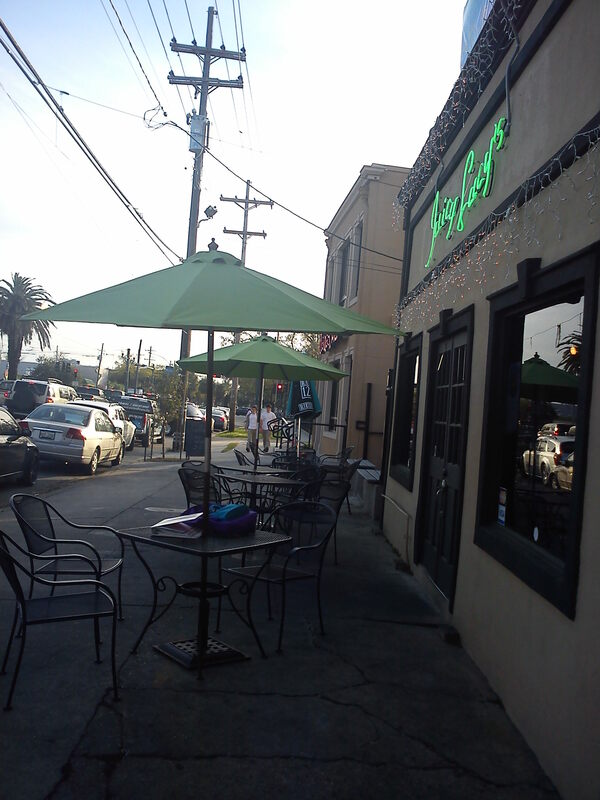 According to a 2011 interview for Lagniappe Magazine, the owners decided that a donut shop would fit into the neighborhood because of the large number of Northerners that have immigrated to the Mid City neighborhood in recent years. 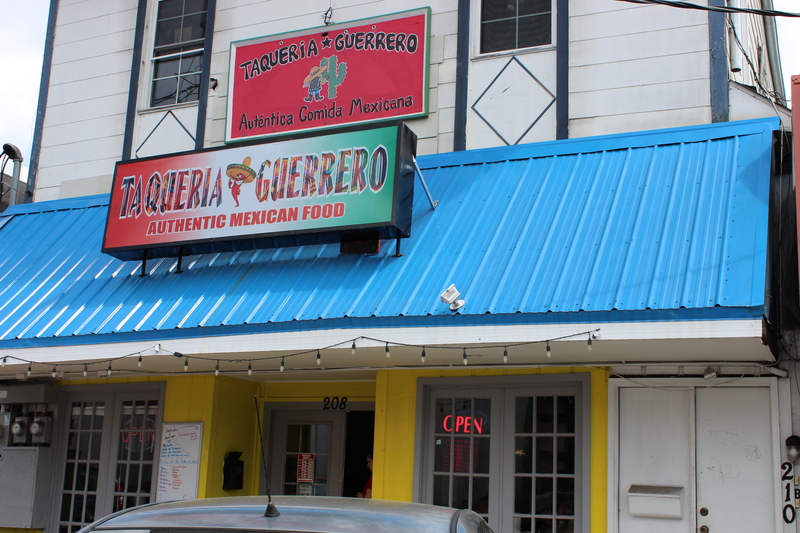 In the same interview, they discuss adding churros to the menu to appeal to the large number of Hispanic residents in the neighborhood. 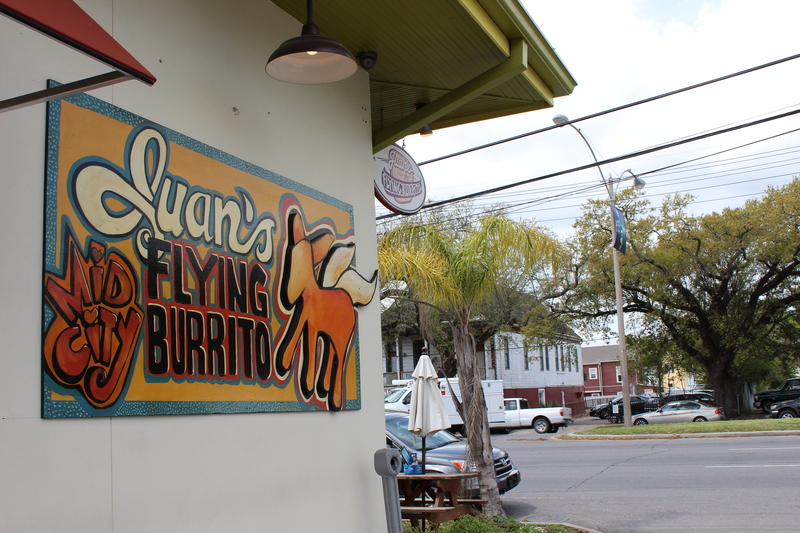 This suggests that the owners of this particular eatery are aware of the demographic changes in Mid City, and are using that knowledge to increase the success of their restaurant. This is one of the newer restaurants in our study. It will be interesting to check back in a few years to see how Blue Dot is doing. I visited Blue Dot Donuts on a sunny Monday, late in the morning. I live very near to the shop, so I hopped on my bike and pedaled there. On my way, I ran into a friend who lives a few blocks away. He had already been to Blue Dot that morning on his way to classes at Delgado Community College. It surprised him that this would be my first time visiting the shop. I have already eaten the glazed one. The shop is fairly small, with enough room for the pastry cases and a few tables. The flat screen TV on one wall was tuned to Food Network, and Paula Deen was busy stuffing something with butter. I tried to ignore her as I made my donut selection. There were many types to choose from, but I am a traditionalist when it comes to donuts. 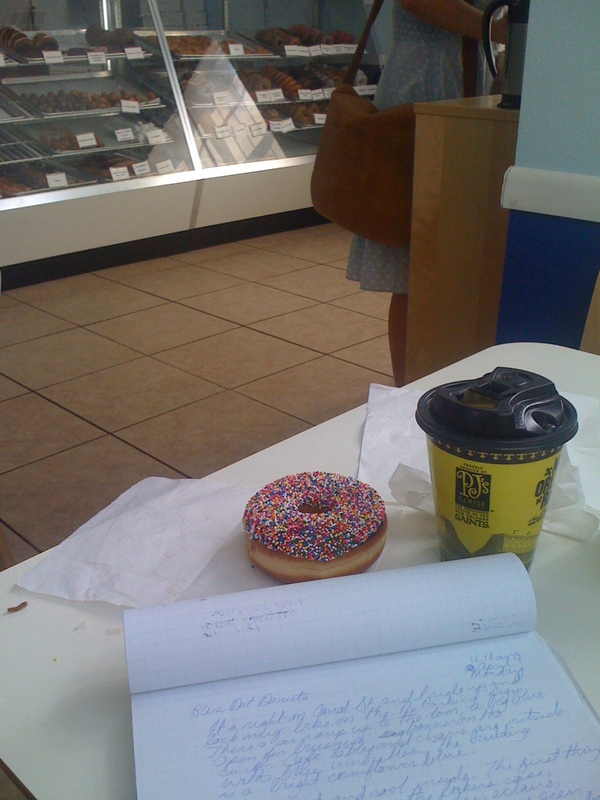 I got one regular glazed, and one with chocolate icing and rainbow sprinkles, as well as a cup of coffee. I settled down at one of the inside tables and pulled out my notepad to do some participant observation. No one really batted an eye. There was even another woman in her twenties with a laptop and books out on her own table. I noticed a wide range of people coming into the shop. The majority of customers were in their twenties and thirties, but some were much older adults or young children. Although most customers were White, there were African American customers, Asian customers, and Hispanic customers visiting the shop during my observation. A customer or group of customers would come in about two minutes or so. Most of them took their orders to go in white paper bags, but some took advantage of the weather and sat outside at the café tables to enjoy their donuts. One mother with a young son came in and asked for the bacon donut, saying that they had called ahead. The woman at the counter handed them paper bag from behind the counter and mentioned that they were getting the last ones for the day. Some of the next customers asked about them as well. They seem to be very popular! As I mentioned above, it is recommended that you call ahead if you are interested in trying one. I stayed at Blue Dot Donuts for almost an hour. I don’t think that I have ever spent such a long time eating donuts. It was quite an exercise in self control. I’m glad that I know more about the little blue building that glows at night. I am curious how the Mid City Market and the Lafitte Greenway will affect the little donut shop. It is possible that people coming into the neighborhood for shopping, or via the Greenway, will take the time to go a few extra blocks and pick up a treat. I think that it is also possible that Blue Dot Donuts, being a little further from the new developments, may stay the neighborhood shop that it is already. It is also interesting to me that the owners have specifically referenced the changing nature of Mid City in their business plan. Perhaps this will allow Blue Dot Donuts to stay flexible and current as Mid City changes in the near future. I had the opportunity to talk with Dennis Schuermann, the owner of Wit’s Inn, about his establishment’s relationship with the surrounding neighborhood, why he believes the area at Canal Boulevard and Carrollton Avenue has become a successful “restaurant row,” and what he believes will be the effect of the new development in the area on the neighborhood and the restaurant row. Wit’s Inn draws many of its clients from the surrounding neighborhood. Possible reasons for this include the recent trending of smaller, neighborhood bars that accommodate sports fans and serve food, as well as patrons’ desires to avoid DUI’s. As many of the people moving to Mid-City are post graduates, a large portion of the patrons of Wit’s Inn are between the ages of 25 and 40 years. One of the reasons Mr. Schuermann cited concerning the reason he established Wit’s Inn in the location that he did was that he looks for areas with potential for growth. When Wit’s Inn opened in 1995, this area was not fully populated with restaurants; he believes that the success of his establishment, Venezia, and Brocato’s have possibly influenced the influx of restaurants along the row. Restaurants such as Venezia, Theo’s, and Dominoes that serve similar types of food, such Italian dishes and pizza, provide enough of a different experience to keep competition with each other lower than one would expect. Concerning competition between the restaurants in this row, the chain restaurants do not seem to significantly compete with the more local establishments, and there is a diversity of demographics catered to by individual restaurants; there are family targeted restaurants, 21 and over establishments, dessert and sweets focused shops, and restaurants designed for convenience foods. Mr. Schuermann sees the development of the vacant strip mall as a potential positive for the neighborhood. He believes that the placement of new businesses could bring facilities to the neighborhood that might attract more residents to the area, and that Winn-Dixie will be a good competitor of Rouses. He does not see the food businesses that intend to open in the developing area as a severe threat; the area is not saturated with restaurants as is the Canal and Carrollton row. A major concern with the development is whether parking will be addressed properly. As the area is already over populated with cars, insufficient parking could hinder the success of the businesses. Citing bikes as an integral part of the Mid-City neighborhood, Mr. Schuermann is an advocate of developing more bike accommodations along Carrollton, such as bike parking and rest areas. He would also like to see the Lafitte Corridor extend to the other, less developed side of Carrollton. Hello again. As promised in my last blog, this entry will mainly focus on the interviews that were conducted by Stephanie and myself. 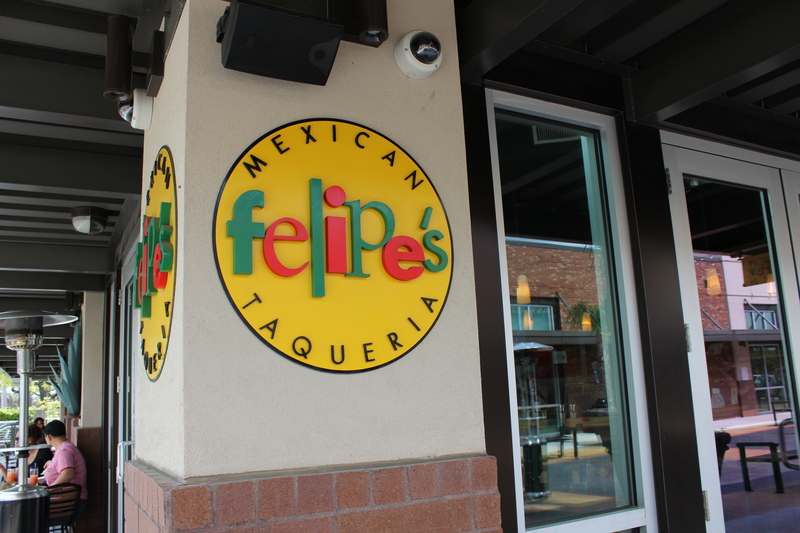 We went into each interview hoping to gain some insight on why this cluster of restaurants is here and how the Greenway Project and the new plaza development will affect them. The following is a map that shows the changes that these new developments plan on bringing to the area. 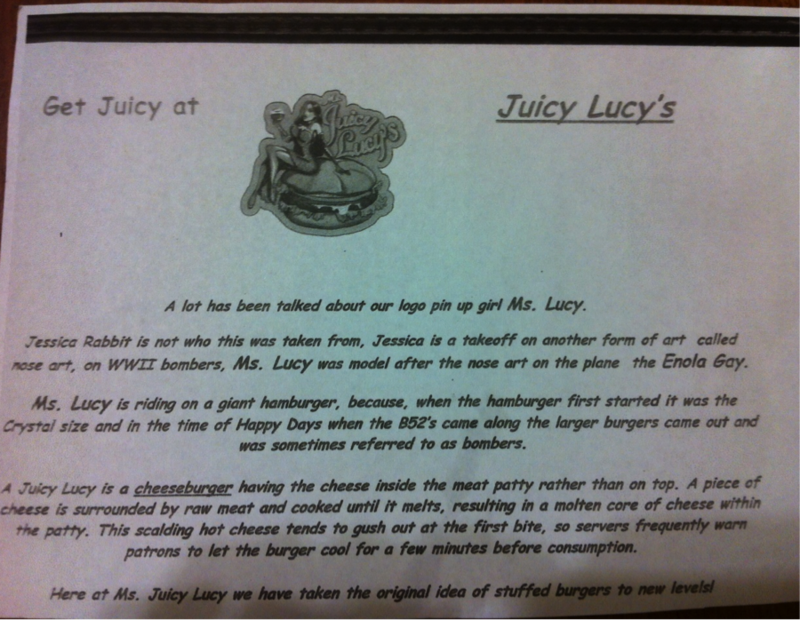 Stephanie and I started off our interviews at Juicy Lucy’s. As we entered the restaurant we were greeted by Denise Thomas, the manager of Juicy Lucy’s. We asked her if Mr. Mike Juan was available for a quick interview. Denise informed us that Mr. Mike has been spending a lot of time at their soon-to-be new location in Metairie on Houma Blvd. She agreed to sit with us and answer any questions that we had, despite the fact that she was waiting on tables as well. Denise has been working at Juicy Lucy’s for 9 months, but has been in the restaurant business for the majority of her life. She’s managed Mr. B’s Bistro in the French Quarter and Houston’s on St. Charles. She has also written employee manuals for Neows. We asked Denise about the history of the building. She says that she has lived in the neighborhood for 16 years and she’s seen at least 13 other businesses housed in this particular building. Some of these businesses consisted of other restaurants, coffee shops, and even a small grocery store, Denise tells us. We asked her if she was worried about the competition that the Greenway Project and the plaza development may bring and she responded with, “Pfft! NO! We make over 900 burgers a week and are opening a new location so we must be doing something right.” She tells us that mid-city people don’t want chain food so she isn’t too concerned with Five Guys. After the interview with Denise, Stephanie and I decided to walk over to Redemption. The hostess informed us that Mr. & Mrs. Delaune were out for the evening. When we explained to her what we were doing, she was quick to introduce us to Joey Lacaze. Joey has been a waiter at Redemption for 3 months, but has been living in Mid-City all of his life. When we asked Joey how he felt about the Greenway Project and the plaza development, he looked confused. He had no idea what we were talking about. After explaining to him what the plans for the area were, he seemed excited. “Yes! A Pinkberry will be in town”, he says. On a separate day, an interview was conducted with Chef Greg Picolo. When he was asked about his feelings on the Greenway Project and the plaza development, he shows little concern about competition. 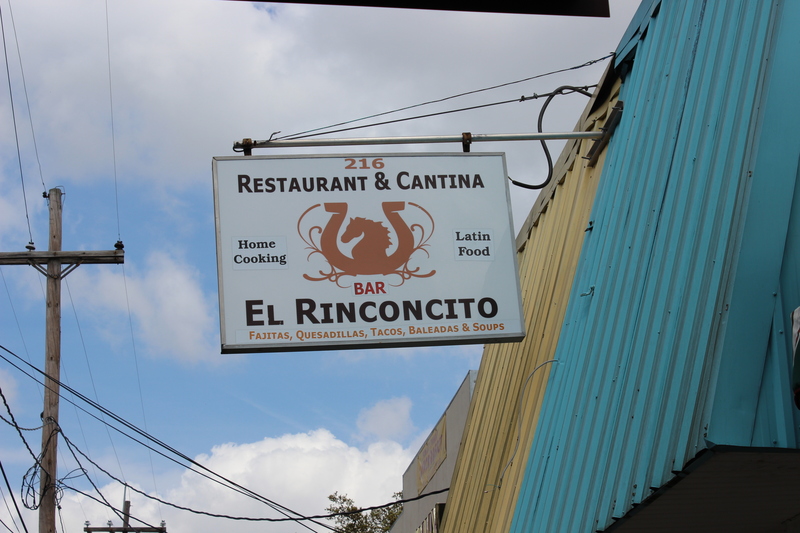 He says that the Mid-City restaurants are like one big community and he isn’t worried about competing with someone else. He says that if another restaurant is making something similar to what Redemption sells, he will just have to improve the way he makes the product to keep the customers coming back. He describes the food at Redemption as “upscale, ya’ mom ‘n dems”.